A story published Sunday in the New York Post claimed Amazon is planning for a chain of robot-enabled supermarkets. Staffed by as few as three human workers at a time, the stores would pull in profit margins north of 20 percent, an unheard of sum in an industry used to low single-digit percentage margins. ins… – they've mixed up their meds! added in a later tweet, "if anybody knows how to get 20% margins in groceries, call me! :)" Asked for additional comment, a spokesman for Amazon said Tuesday the Post story was "complete fiction." 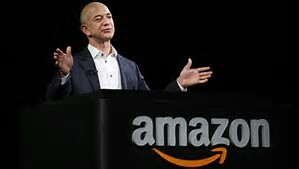 The Post didn't respond to a request for comment Rumors from anonymous sources often swirl about Amazon and its future plans, in part because Bezos and the retail giant rarely come out to dispute such claims. Amazon tends to fall back on its characteristic secretiveness, instead of offering any potential clues about what it may be planning to do next. Yet, it appears the Post's story about a chain of robotized grocery shops was a bit too rich for Bezos to let lay. Or, perhaps, Bezos is taking a page from another important leader who often tweets about "fake news." Amazon officials also denied the grocery concept on Sunday in the Post story. This isn't the first time in recent months that Amazon has batted down rumors related to its ambitions in grocery.